2X - $99.99 Only 6 left! All Hallows Eve is a time made sacred by many cultures for the belief that it is during this time that the veil between the physical and spiritual realms becomes the thinnest. It is at this time that ghosts and other haunts are able to reach through the barrier that holds them from the world of the living and enter back into this place… occasionally even bringing across a few strange creatures that hadn’t ever existed here in the first place. It is this mystery and risk that draws out the adventurous nature of many as they seek out these strange beings… that their brief foray into the waking world can bring about a lasting memory of the night. But, the thinning veil is not only an opportunity for those who dwell beyond our world. It is also a chance for we simple mortals to reach into the spiritual realm and bring to our side a bit of the arcane and mysterious power that dwells on the other side. For those skillful and clever enough to take this dangerous opportunity, though, we wonder if the power that can be drawn through need be so temporary. Even if it lasts only one night, however, who can give up a chance to wield true sorcery!? Many have taken the chance before and, now, it is your turn. Channel the dark and mysterious powers of the other realm in this Mystic Sorcerer costume and show to the world precisely what power can be. 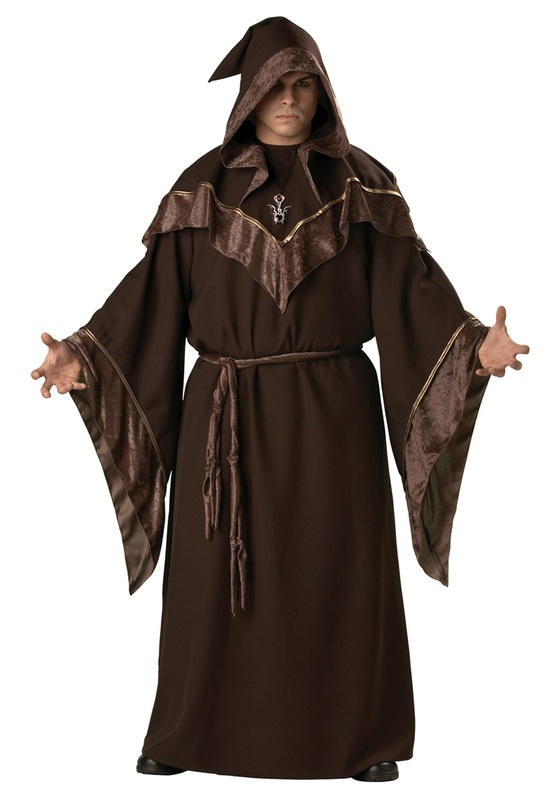 This brown poplin robe comes with wide sleeves and gold piping to contrast the darker tones. The optional hood fastens with Velcro but certainly completes the look with the brown crushed panne sash and silver/black medallion. Include a few additional accessories like a wand, crystal ball, or ancient tome and not only will you open a breach into the arcane realm beyond but might even conjure a few friends to finalize your power! Mit der richtigen Versand Option ist das Bestellen super einfach. Es hat mich wirklich erstaunt wie einfach die Abwicklung ist. Einkaufen mit PayPal bezahlen Versand Option so gewählt das UPS die Verzollung gleich übernimmt. Bestellung wurde super schnell geliefert. Paket ist bereits nach drei Tagen angekommen. Sogar Rabatt Aktionen des Lieferanten haben ohne Probleme funktioniert. Deswegen kann ich das hier nur empfehlen. Excelent Service and fast delivery. I am very impressed with this costume. The outfit came in a garment bag and the wardrobe set was tailored beautifully. The costume is very comfortable and easy to wear to parties. I think I will wear it to Renaissance Festivals as well. I highly recommend this costume and I plan to purchase more costumes from HalloweenCostumes.com. Well worth the money! I only wish it came in other colors. Measurements were perfect. Nice material.